Seller will give you a gift certificate in the amount of 6,98 RUB for a positive review of the product purchased. After payment you will receive an instant link to activate Gift in Steam. ATTENTION! 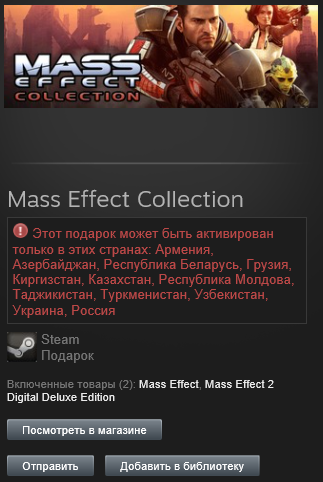 This gift can be activated only in those countries: Russia, Armenia, Azerbaijan, Belarus, Georgia, Kyrgyzstan, Kazakhstan, Moldova, Republic of Moldova, Tajikistan, Turkmenistan, Ukraine, Uzbekistan. 3. Once activated, the game will appear in the library, and you are ready to install it, or to remain in your inventory to share or send the game as a gift to a friend. - The link can only be activated once! - Activation occurs only on the account that you are logged into the current browser! - After the payment and receipt of the reference, do not pull with the activation, try to pick up his game in the shortest possible time to Gift is not kept in inventory bot-distributor. Seller will give you a gift certificate in the amount of 6,98 RUB for a positive review of the product purchased..